Founded in 2004 by three friends and musicians who love and embrace chamber music, the Monument Piano Trio has quickly proven itself as a talented and promising ensemble. After a critically acclaimed debut, the Trio was invited to be the first Artists-in-Residence at An die Musik – a cozy chamber music venue in the heart of Baltimore’s cultural district. Coming from different musical backgrounds, each member of the trio brings something unique in their style of playing. Together, the styles and genres unify into one distinctive sound. 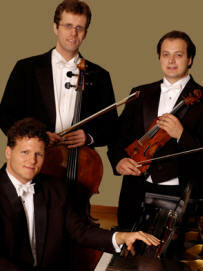 Critics have called the trio “Excellent” and “Breathtaking”, and their concerts have been consistently well received by the public. Entering its third season, the Trio presented a six-concert series as part of their continued residency at An die Musik Live. In 2007, the Trio joined musical and creative forces with the Analog Arts Ensemble, a cutting-edge arts collective. As members of this group of artists, the Trio aims to present concerts in a new and exciting way, while retaining the highest level of artistry and musicianship. Also in 2007, the Trio established a Composition Competition. Yet one more project is in the works for the Monument Piano Trio. The group plans to release their debut recording by the end of the 2007-08 season. The CD will include the winning composition from the Composition Competition.